Dallas Cowboys quarterback Tony Romo celebrates after an NFL wild-card playoff football game against the Detroit Lions, Sunday, Jan. 4, 2015, in Arlington, Texas. While the wild-card round of this year’s NFL playoffs was wild, a lot of the action followed familiar scripts: Skeptical Football regular Andrew Luck continued to impress in the Indianapolis Colts’ win against the Cincinnati Bengals. The Detroit Lions jumped out to a big lead — uncomfortable territory for gunslinger extraordinaire Matthew Stafford — against the Dallas Cowboys and, sure enough, Tony Manning Romo successfully engineered a double-digit comeback victory — though possibly with a little help from the officials. The Carolina Panthers brought their record back to (exactly) .500 for the first time since October against the Carson Palmer-less Arizona Cardinals. And the Baltimore Ravens beat high-flying Ben Roethlisberger and the Pittsburgh Steelers, on the road. But while the wild-card games were a nice diversion, the big guns will only come out after the bye. At this stage of the playoffs, there are an equal number of bye teams and wild-card game alums. Not only are the bye teams better-rested and more accomplished, but they have home-field advantage — both this week and against any surviving non-bye teams in the conference championships. So our eventual Super Bowl winner will almost certainly come from that cohort, right? If recent history is a guide, the answer is no. The wild-card veterans have more than held their own, winning seven of the past 14 Super Bowl trophies. Consider what this takes: First, having just won a game for the right to make the final eight, a team has to turn around and play a fresh top-two seed in the divisional round — on the road. And if it wins that game, more often than not it has to play the other top seed — on the road. And if it wins again, more often than not it has to play one of the other conference’s top seeds in the Super Bowl. Compare that to the route a bye team takes: It plays only two playoff games before the Super Bowl, and at least one of them is at home, against a lower seed. While anyone with a rooting interest would prefer his team take the easier road, teams that do manage to survive the playoffs’ “trial by fire” are disproportionately successful the deeper into the postseason they get. This chart goes back to the introduction of the salary cap in 1994. Prior to the 1997 John Elway-led Broncos victory, few teams survived the trial by fire (“TBF”) for long (i.e., none made the Super Bowl), so I typically consider that the start of the TBF era. As we would expect, a large share of TBF teams (meaning wild-card round veterans) are eliminated by their higher-seeded opponents right away. Over the entire period, TBFers won just 24 of 80 divisional round games (30.0 percent). And in the TBF era, including 1997, they’ve done only slightly better, winning 21 of 64 games (32.8 percent). But if they survive that second game, all bets are off. Since 1997, of those 21 TBF teams who made it to the conference championship games, 17 faced a top-two-seeded bye team on the road (the other four faced each other). The TBF teams in that scenario won 9 of the 17 games (52.9 percent) they played.2 That’s right, TBFers who made the conference round have won a majority of their games against bye teams, despite playing in hostile territory. Those nine all faced another top-two seed from the other conference in the Super Bowl — such as the New York Giants against the then 18-0 New England Patriots in 2007 — and seven of nine triumphed. Overall, TBF teams have an 8-3 record in Super Bowls (in the salary cap era), including a 6-1 record in their last seven appearances. That one losing team was the Arizona Cardinals,3 who lost 27-23 against the Pittsburgh Steelers in 2009, but covered the 6.5-point spread. TBF teams have gone 10-0-1 against the spread in Super Bowls, and 11-6 in conference championships since 1997. That stunning 21-6-1 record against the line is meaningful even if you’re not a sports bettor. It means that this phenomenon isn’t just an artifact of stronger teams happening to be lower seeds for incidental reasons. TBFers legitimately exceeded expectations — even market expectations. It also makes it fairly unlikely that the phenomenon is purely a result of chance. The probability of going 21-6 on what should be a 50/50 proposition is roughly 0.002, or about 1 in 500. Of course, 1-in-500 events happen all the time, so it could just be that these teams have gotten lucky. But the probability that an unlikely phenomenon results from something other than chance is proportional to how plausible the other explanations are. If a coin comes up tails on 21 of 27 flips, you say “wow,” but the coin is still unlikely to be weighted. But say a tennis player wins 21 of 27 matches — she could have gotten lucky, but a more likely explanation is that she’s good. The first reason — at which I’ve already strongly hinted — is that, by virtue of the tougher road that TBF teams face to get deeper into the playoffs, their continued presence tells us more about their quality than that of their bye-having opponents. At the very minimum, the team that wins the wild-card round has one more win going into later rounds than its regular-season record. In some cases, this is enough to cover or exceed any gap between it and a higher-seeded team. Such is the case with this year’s Cowboys, who, at 13-4, now possess the best record in football (though they will still be on the road against the Packers). Moreover, that extra win didn’t come against an average NFL team, it came against a playoff team, meaning it’s probably worth a little more than an average win. With each road win against top competition, a TBF team’s pedigree gets stronger and stronger. A lot of teams win a lot of games without ever getting road wins against top teams. Obviously upsets happen, and they don’t always mean that the upsetting team is a secret powerhouse. But such upsets are much more likely to happen if the upsetting team is actually better than previously thought (such as when it’s actually much better than its record or playoff seed would indicate). So as a matter of Bayesian inference, it’s not so shocking that teams that accomplish one seemingly unlikely result may continue to accomplish more. In subsequent rounds, a TBF team’s opposition has also won playoff games, but against weaker opponents and usually at home. Since these are more expected results, they have much less of an impact on our assessment of those teams. As a test case, if the playoffs were seeded completely randomly, we would expect to see this effect: A team that had won three road games would be a favorite over one that had won two home games, simply because winning on the road is harder. And the real case can be much more drastic: By the time we get to the Super Bowl, we may have a TBF team — which got there by winning three road games against the top three teams in its conference — facing off against a bye team that has won only two playoff games, at home, against teams with worse records. The problem with that explanation is that it only gets us so far. With an entire season of games under their belts, the difference between a big underdog and a big favorite shouldn’t be reversible merely as a result of three strong wins versus two mediocre wins. Unless those wins come in games that are substantially more important to our assessment of those teams than normal games.5 Playoff wins seem to be just that. Playoff rosters are more current, reflecting injuries, trades and the like. Playoff results are unlikely to be affected by the various late-season tactical strategies that teams employ, whether that be “tanking” to get a top draft pick, resting starters to avoid injury and fatigue, etc. Although I reserve my right to skepticism, it’s possible that playoff football actually does have a different nature than regular-season football — whether because playing strong teams entails a different skill set than beating up on scrubs, or because playoff games are more likely to be played in cold weather, or something else. There’s a phenomenon that I think is real by which teams often “save” something for the playoffs or more high-leverage situations in the regular season — such as innovative or “trick” plays. Using a couple of different regression methods to estimate the value of a playoff win relative to a regular-season one, I’ve come up with figures as high as one playoff game being worth three to five regular-season games.6 But this whole line of analysis is tainted because it’s ex post facto. That is, we already knew there was some effect, because that effect is the reason we’re looking into it. So measuring its strength kind of begs the question. We could just modestly assume a mid-sized multiplier (like each playoff game being worth two to three regular-season games), but before we start artfully reflecting on our priors, it would be nice to have a little more insight into the nature of what’s going on. The difference between a TBF team and a typical bye team in the regular season hasn’t changed much, with bye teams having won those matchups around 70 percent of the time. That seems high, but it’s partly because the bye teams have better records and/or hold head-to-head tiebreakers to get in their position. The key isn’t the raw value, it’s that the trend has remained essentially flat. In other words, “parity” — the bogeyman often used to explain a variety of NFL phenomena — probably isn’t the answer. Is it reasonable to think that this reflects a real development in the game? I think so. At least anecdotally, I think teams have been getting more strategic about playing for the playoffs, and treating the regular season as more of a qualifying period than an end in its own right. Not only have we seen a lot of resting of players (where QBs like Brett Favre used to take every snap to the bitter end) and tanking, but we’ve also seen things like experimenting with young quarterbacks, and benching reasonably decent ones as a scapegoating maneuver. Also, football has evolved into more of a passing or finesse/strategy game, which may be contributing to teams sometimes being substantially better or worse at different times in the season (for example, if you figure out how to use a previously unheralded third receiver in a particularly effective way, it may transform your offense overnight). And this may make matchups more important as well. When the balance of power between teams rests on intricate relationships of many variables rather than just size and strength, it’s easy to see how matchup problems might hinder a team’s regular-season outcomes, or bolster its playoff ones — depending on whom it faces. But I’m not sure any of this gets us 100 percent of the way there. In fact, virtually nothing explains the status quo over the last 14 years (much less the past nine), wherein divisional road teams have been winning as many (or more) Super Bowls as their home opponents. That is, to some extent, just freaky-deaky. Let me demonstrate by imagining an absurd case: Say there were one single best team in the playoffs, and that team won every game it played, and thus won the Super Bowl 100 percent of the time — and then assume playoff seeding were completely random. 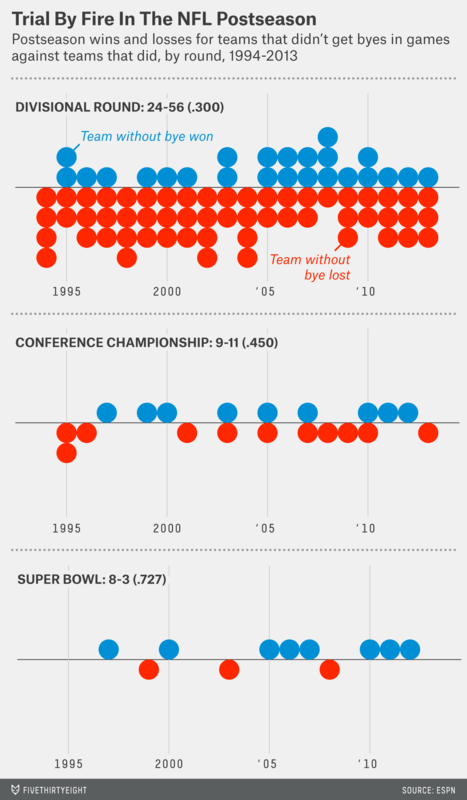 Since twice as many teams play in the wild-card round as those that get byes, the Super Bowl winner would end up being a TBFer two-thirds of the time. 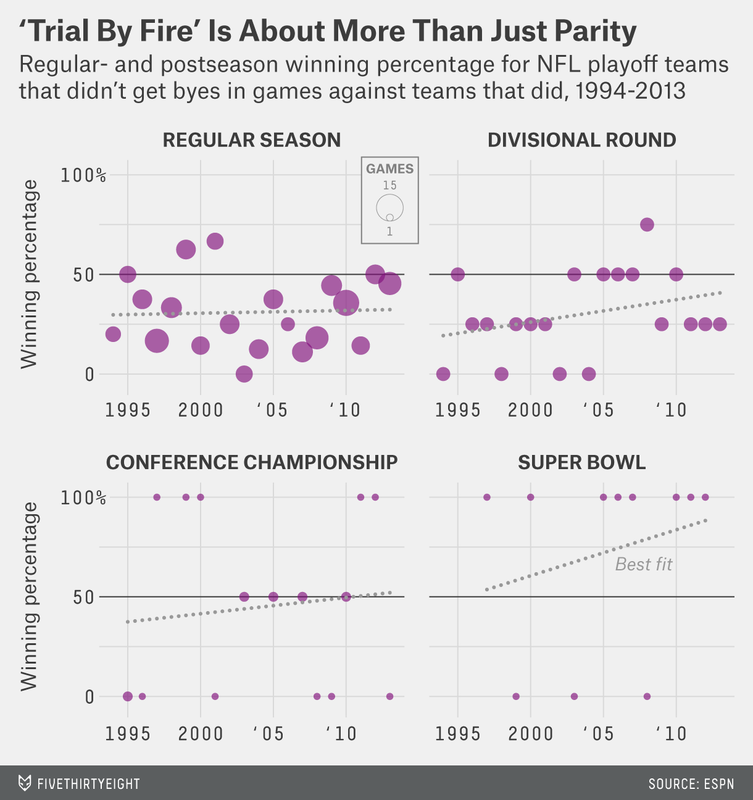 Thus, under the most absurdly extreme case imaginable, we would still expect the “trial by fire” to produce a champion at the same rate that the real-world trial by fire has over the past nine years. That absurd case is so crazy that it’s very unlikely that the TBF trend will continue as vigorously as it has in recent years. But I wouldn’t expect the phenomenon to go away, either. I expect that teams that win against strong opponents in a playoff environment will continue to be extremely dangerous, regardless of appearances. One thing we can do practically and theoretically is to consider what types of teams are most likely to exhibit the TBF power-up effect. So let’s take a gander at this year’s winners in the wild-card round. Dallas and Indianapolis are two division-winners who won in the wild-card round against fairly strong teams (the 11-5 Detroit Lions and 10-5-1 Cincinnati Bengals, respectively), and who weren’t that far behind their rivals to begin with. Counting the playoffs, Indianapolis now has the same number of wins as the Denver Broncos and New England Patriots, and as of this moment Dallas has the best record in football (at 13-4). Both the Cowboys and the Colts face tough road games against the Packers at Lambeau and the Mannings in Denver. That makes it less likely that they’ll be picking up the TBF banner — unless they win. The difficulty of these games would make victories in them even more meaningful. The Baltimore Ravens had probably the most impressive win in the bye round against the Pittsburgh Steelers. They also have experience winning championships “the hard way” twice. And they’re playing the Patriots, who have been vulnerable to TBFers before. Since winning their last championship in 2004, the Patriots are only 5-4 against TBF teams as a bye team themselves, most notably losing to the Giants in the 2007 and 2011 Super Bowls, and to the eventual-champion Ravens in the 2012 AFC championship game. Of course, the most fun TBF case would be if the Carolina Panthers somehow kept winning. But at the moment, they haven’t accomplished much. In addition to their awful regular-season record, it’s not clear that beating the Arizona Cardinals without Carson Palmer on the field meant much (the Cards ended up 0-3 with Ryan Lindley starting this year). But if the Panthers somehow pull off a win against the powerhouse Seattle Seahawks this week, watch out! As we know, a New England vs. Green Bay Super Bowl matchup is inevitable. I should also note that the overall 45 percent win rate in this round in the salary cap era is still extremely high for road teams against higher-seeded competition. One of the TBF teams that had to beat another TBF team in its conference championship rather than beating both top seeds. Though I would expect the market to adjust accordingly. For a somewhat extreme example: This is what things would be like if team quality in the NFL behaved like a ladder ranking, where each time a team beats a team of higher quality, it assumes the other’s position. Under such circumstances, a team like the 2011 New York Giants would have been a favorite against the 2011 New England Patriots by virtue of having beaten the 15-1 Green Bay Packers in the NFC divisional round. This can be somewhat reproduced by using an Elo system with a very high k (meaning calibrated to adjust very rapidly). We would also expect it to rise more sharply in later stages is because the effect is compounding.